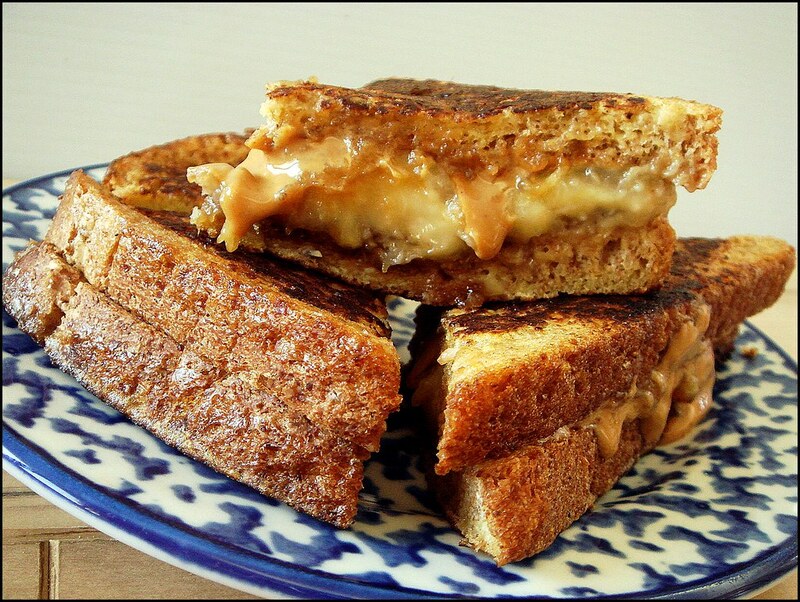 Most people think Elvis is The King because of his music, but I think he's the king because his favorite sandwich is one of the most brilliant inventions known to humankind: the grilled peanut butter and banana sandwich. How the heck to you improve upon a sandwich of such epic proportions? Is it even possible? Can it be done? 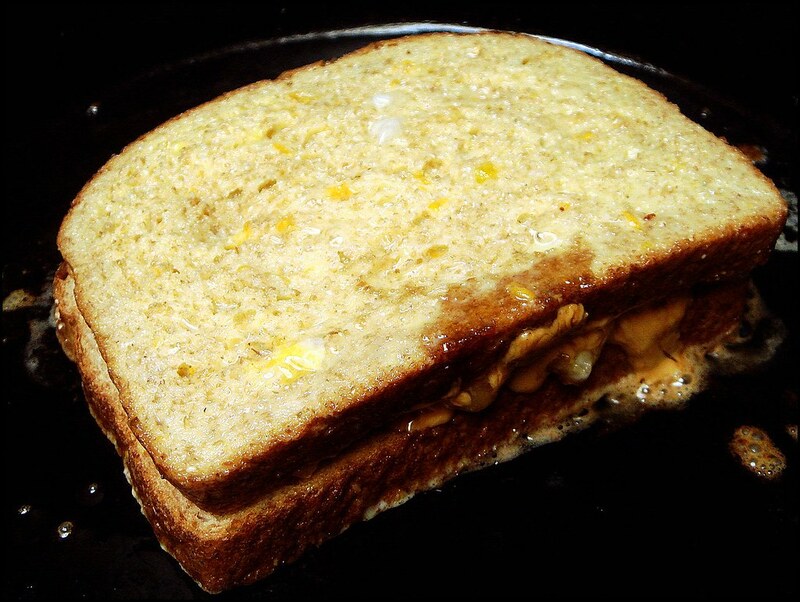 Well, the other day for breakfast I decided to Frenchify a grilled pb sammich by dipping both sides in an eggy custard. BUT. 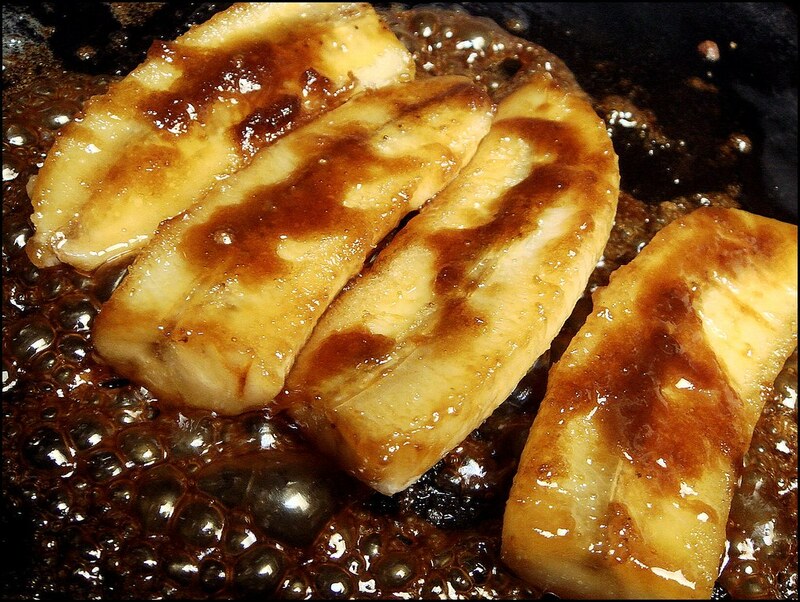 I also decided to caramelize the bananas for an even more intense version of The King's Classic. I also used Nature's Pride bread, which I reviewed a while ago. After having not made much homemade bread recently and eating various healthy store bought bread, this definitely had the closest to homemade texture out of the few brands that are rotated here. The entire process was pretty simple: While the bananas are caramelizing (which doesn't take very long, otherwise the bananas will become too mushy), mix the eggy custard, a mixture of 1-2 eggs with milk, a bit of sugar, freshly grated nutmeg and orange zest. 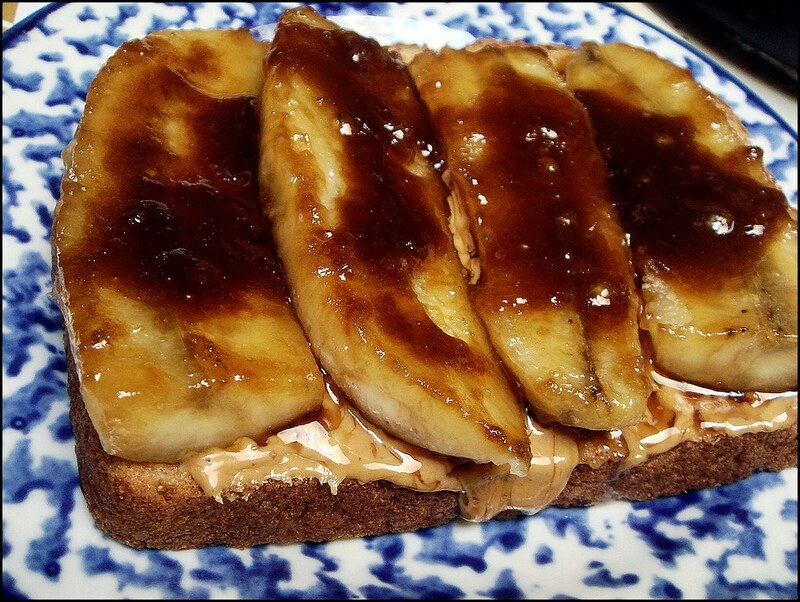 Spread peanut butter on one slice of bread, then layer the bananas on top once finished; top with final slice of bread. Wipe the skillet clean with a paper towel, then add some butter, oil, or cooking spray and bring back up to heat. Carefully dip both sides of the sandwich in the custard and place in skillet. Cook until both sides are golden brown. Remove to a plate, let cool briefly, then slice in fourths and eat! This is definitely not a light sandwich by any means, but it's filling and delicious and very great way, in my opinion, to begin the day. And I'm sure it's King Approved. Heat a skillet with 1 tablespoon butter over medium heat. When heated and butter is bubbly, sprinkle brown sugar over butter and stir lightly to combine. Lay banana sliced on top and let cook 1-3 minutes. Carefully flip to other side and cook for 2-3 more minutes or until bananas are caramelized, but not falling apart. Meanwhile, in a shallow bowl whisk together eggs, milk, sugar, orange zest, and grated nutmeg until frothy, about 30 seconds. Spread however much peanut butter you want on one slice of bread, then carefully layer the bananas on top, spooning any brown sugar left in skillet on top; cover with second slice of bread. Wipe skillet clean with a paper towel. Return to heat and add enough butter, oil, or cooking spray to lightly coat entire surface of skillet. Taking care that the bananas don't fall out, dip both sides of sandwich in egg mixture, letting each side sit in the custard for a few seconds to soak up enough liquid. Place in skillet and cook over medium heat on both sides until golden brown, adding more butter as needed. Remove to plate and let cool briefly. Slice into fourths and enjoy. Hey guys! 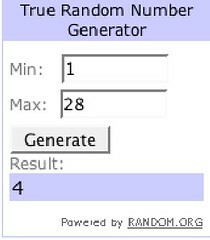 Sorry for not concluding the giveaway post yesterday, but I had some computer issues that prevented me from doing anything. Yesterday's post was set ahead of time to publish early, so that's why it got up there. Anyway, thanks so much to everyone entered. I really enjoyed reading what you guys are looking forward to this summer! Please email me at caudagaliATyahooDOTcom by tomorrow night so I can pass your info along to Tazo. If I don't hear from you then, I'll have to pick another winner. 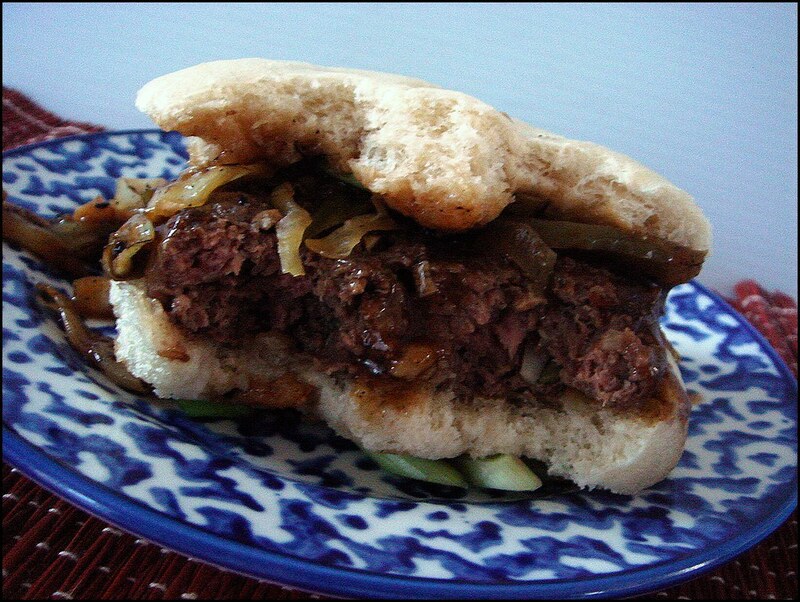 There are many variations for burgers out there, but one I don't hear about often is an Asian-inspired burger. 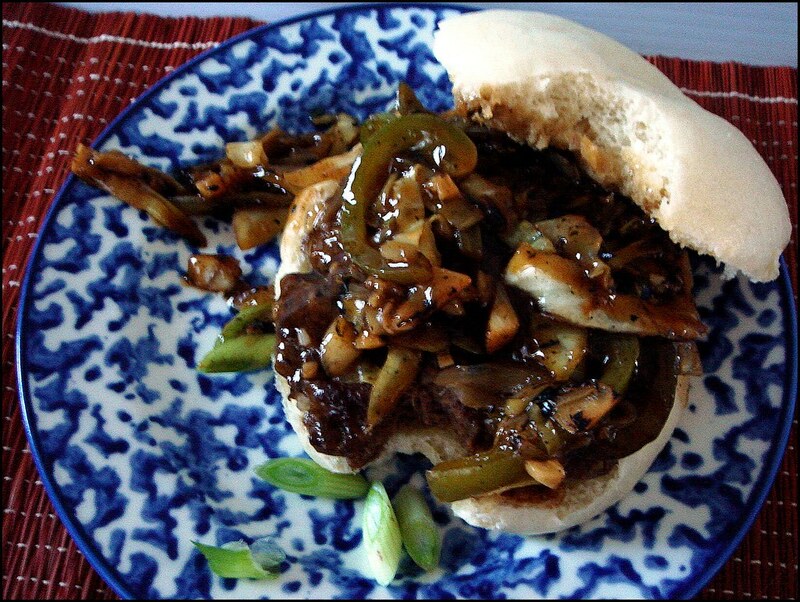 My requirements in coming up with my own version was to flavor the ground beef with the ingredients I used when I made filled steamed buns, create a simple stir fry topping that features cole slaw vegetables, and finally make steamed buns to use in place of traditional hamburger buns. First, I mixed the ground beef mixture together and set it aside to give the flavors a chance to develop. Unfortunately, I didn't measure the amount of beef I used, but it made about 3 burgers. I definitely didn't use a pound, probably not even half a pound, but I kept the amounts for the flavorings the same. Up next was the stir fry slaw, a mixture of shredded green cabbage, onions, garlic, a bit of green bell pepper, and sliced green onions. For the sauce I failed and didn't measure anything, but I used about 1/2 cup chicken broth and 1/4 cup water, corn starch, a teaspoon of sugar, oyster sauce, rice wine vinegar, soy sauce, and white pepper. I can't remember if I added any salt, but I don't think I did because the soy sauce I have seems saltier than other brands. For the vegetables, I think I chopped 1/4 of a head of cabbage since it shrinks down drastically after cooking, 1 medium onion, 2 cloves minced garlic, a 1/4 of a bell pepper, and however many green onions I felt like. There definitely was extra slaw left over so I know I probably made more than I needed, but stir fry tastes awesome the next day. 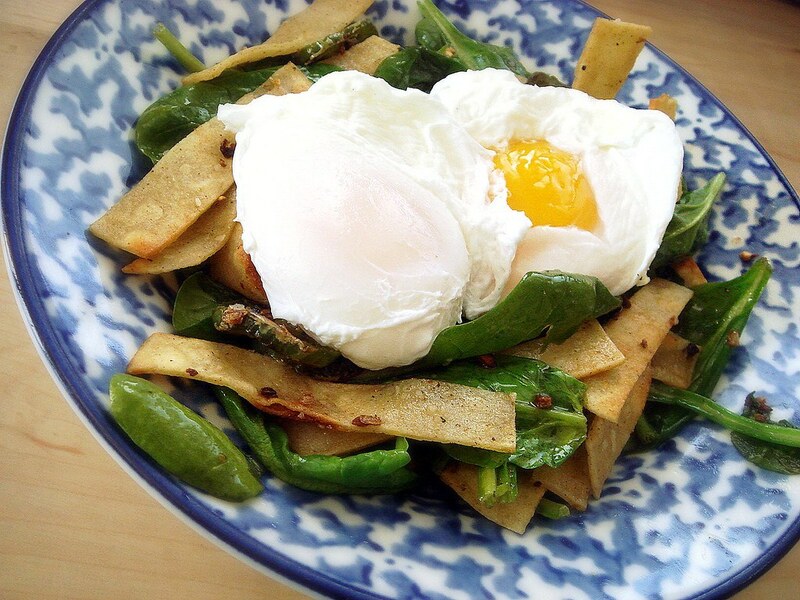 When it came time to make this, I used a cast iron skillet over the wok. Why? I was sick with a cold; my head was stuffy; the skillet was out and already dirty. What I forgot was how well cast iron not only heats up, but retains that heat. As you can imagine, it got to be so hot that the oil evaporated. Whoops! Fortunately, the kitchen didn't smoke up black, but windows had to be opened and fans were required to air the house out. My bad. Also fortunately, the stir fry had an incredibly smoky, charred flavor, and I managed not to burn anything. This, folks, is why I don't cook when I'm ill.
After setting the stir fry aside, the steamed buns were ready to be cooked, the dough having been kneaded and set aside to rise before I made the meat mixture, which I remembered just now and I don't feel like editing the above. I used the same recipe I used last time, though I divided the dough into eight balls, and after shaping I pressed them down flat so they wouldn't be completely like a dinner roll. I steamed them for 15 minutes. Because I could only steam 4 at a time, the burgers weren't started until after the last 4 buns were steaming. As far as hamburgers go, these were incredible, like a stir fry-potsticker-steamed bun all in one bite! The flavor of the burgers came through very well, but the slaw was the biggest hit. I was initially concerned with how well the buns would hold up to the burger, though I needn't have since they held up fine. I really liked the chewiness of the buns. This recipe will be very vague, and I truly am sorry for that. I should have written the ingredients down as I went along, but being sick I just wasn't thinking. What's here is my best attempt at remembering all I did. So as I said, I used a very straightforward, basic steamed bun recipe. Divide the dough into eighths, shape into balls, and flatten after you place the buns on a square of wax paper, on a baking sheet, before letting rise. Steam for 15 minutes. For the ground beef, I used enough beef for 3 hamburgers, so maybe 1/4 pound, though I really have no idea! Everything else was kept the same. Mix chicken broth and water, corn starch, sugar, oyster sauce, vinegar, soy sauce, and white pepper together in a small bowl; set aside. Heat skillet or wok over medium high heat until just beginning to smoke. Adjust heat as needed. Have a dish nearby to place ingredients after stir frying. Add a teaspoon of oil to skillet. Drop in garlic and green onions and stir until green onions look charred; remove to dish. Add another teaspoon of oil, then add the onions and bell pepper and cook until charred marks are visible on onions. After you remove those, cook cabbage in the same way with another teaspoon of oil. Once cooked, add back the vegetables in the dish and stir to mix. Pour the sauce on top, stirring constantly; remove skillet from heat and continue to mix until sauce has thickened. Place in dish and keep covered until ready to eat. 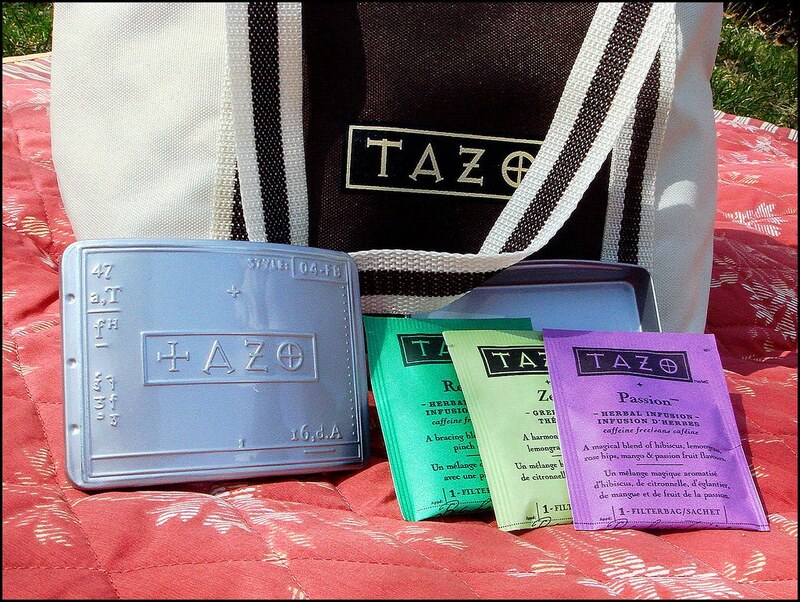 There are only a few days left to enter the Tazo Zero Tea giveaway. 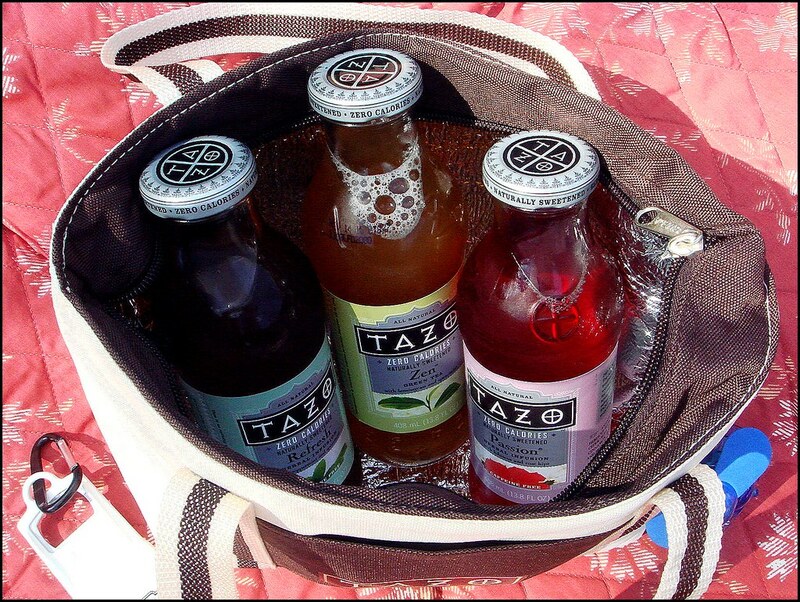 Sweet new teas and a summer beach pack -- two ways to help kick off the summer! No, I'm not talking about something hiding in your nose when you're sick, or that mysteriously hidden bush of poison ivy you didn't notice until you climbed right middle of it. Or that Jolly Green Guy hiding behind the packs of frozen vegetables in the supermarket. 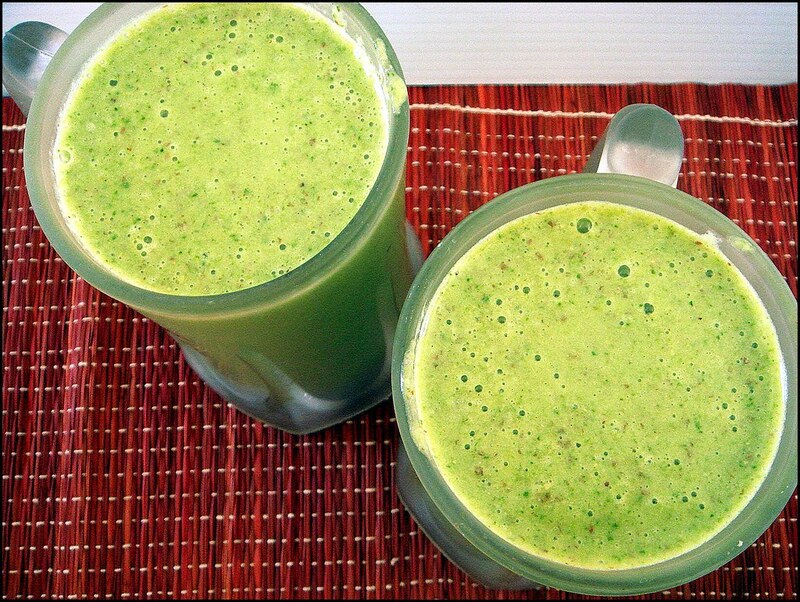 I'm talking about a smoothie that's called Green Monster because of spinach. Really, I think the name sticks no matter what edible green you use, and I've seen the use of kale and other stuff. So far I've just been using baby spinach because it's the easiest for me to get. I believe that I first saw GM's on Caitlin's blog, Healthy Tipping Point, when she talked about how much she enjoyed them and the burst of energy she got after drinking it. Green is my favorite color, so i couldn't resist. Now before you get all, "EWWWW, I hate spinach!" on me, let me tell you that if this is due to an unfortunate occurrence during your youth, it probably wasn't being served in an appetizing manner. (Yes, go ahead and blame your parents for this one.) Secondly, baby spinach has a less intense taste than regular spinach, and unless I'm using frozen (which I would NEVER do for this -- the point is to consume raw greens) all the raw spinach I eat is of the baby variety. I also suggest you make a shake using spinach. While there's a very faint taste, the sweetness from the fruits you add to the smoothie diminish the flavor. Also again, if you let the blender run for a while all the spinach is pretty pulverized and not noticeable. Since warmer weather is fast approaching, I usually enjoy a smoothie post-run. I've been playing around with different add-ins, both fruit and liquid, and today I'll share with you the one that came out the best. Measurements are unfortunately not exact because I was just adding stuff as I felt like it. P.S., I also call this my alternative shamrock shake. It's not minty at all, though I bet you could add some mint leaves and you'd be all set. 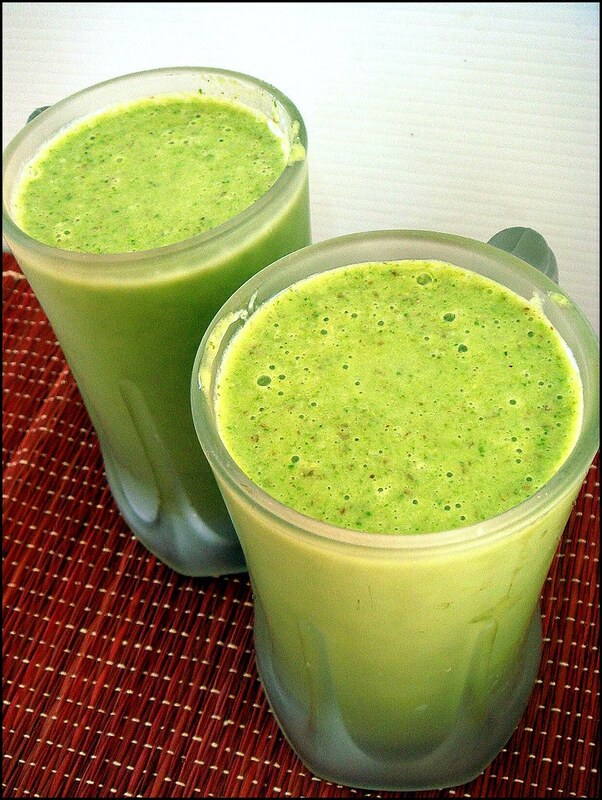 Place spinach, milk, water, and yogurt in a blender. Cover lid and blend for thirty seconds. Add in apple and banana, cover, and let blend for a bit until smoothie looks even in texture and there are no discernible spinach leaf chunks. Finally, add stevia packet and blend to combine. Pour into cups and enjoy. 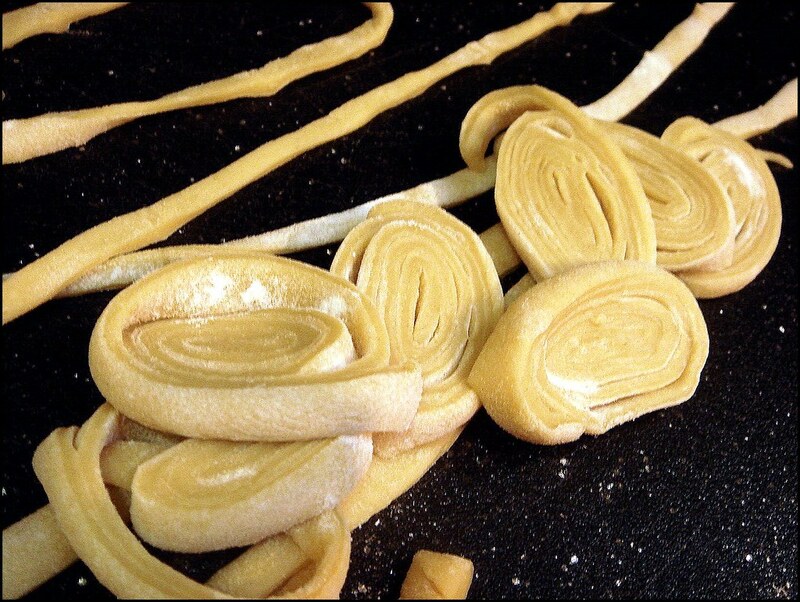 Homemade noodles are pretty simple to make and taste really good in comparison to dried pasta. The one downside is that if you don't have a pasta machine to help roll the dough out, it takes a bit more work on your part but it's still doable. This recipe starts off plainly with eggs, water, and salt. The flour is added and should be mixed with your hands because it's rather stiff and seemingly dry. Once the you fully incorporate all of the flour into the egg mixture, give the dough a few kneads before covering with plastic wrap to rest. 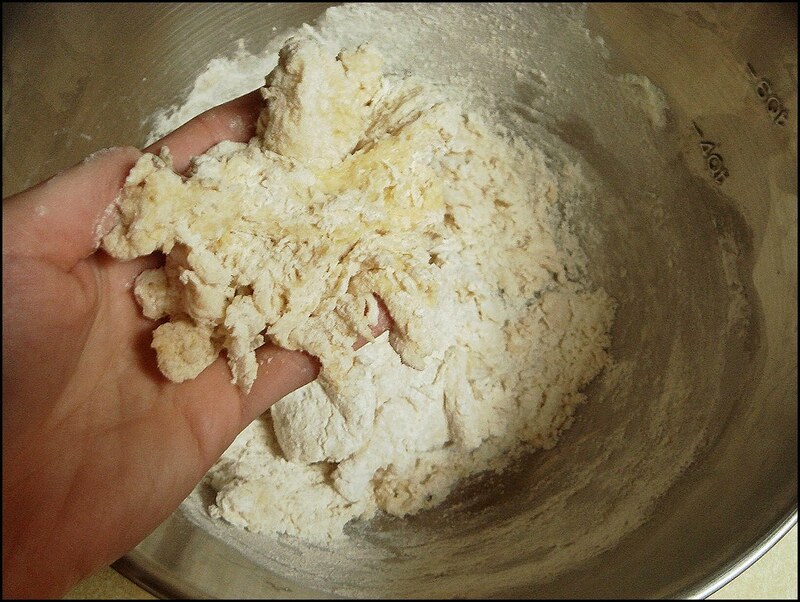 In the second picture, you can see how the flour was given a chance to hydrate and the gluten will have relaxed. Now you're ready to shape the noodles. The part I found tricky was the rolling, mainly because I had to give the dough a few rests between rolling to reach the thinness I wanted. After rolling, you could cut squares or whatever with a pizza cutter if you wanted, though I wanted larger strands so lightly floured the surface of the dough and rolled it up, jelly roll style. 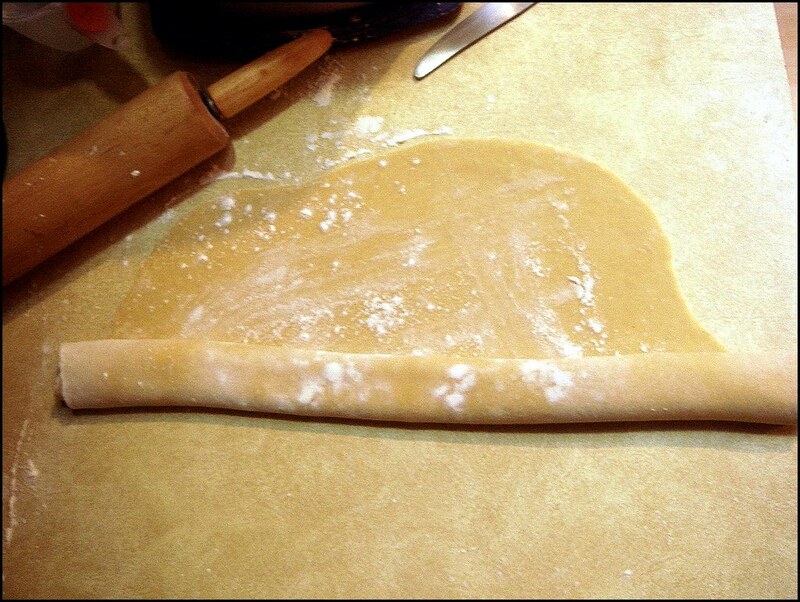 How wide you slice the dough also determines the size of the noodles (keep in mind that it will expand when cooked, too). Separate the rolls and unwind, then lightly toss the noodles with flour. This will keep them from sticking together when the noodles air dry for a few hours. You can also cut the noodles in half if they are too long. 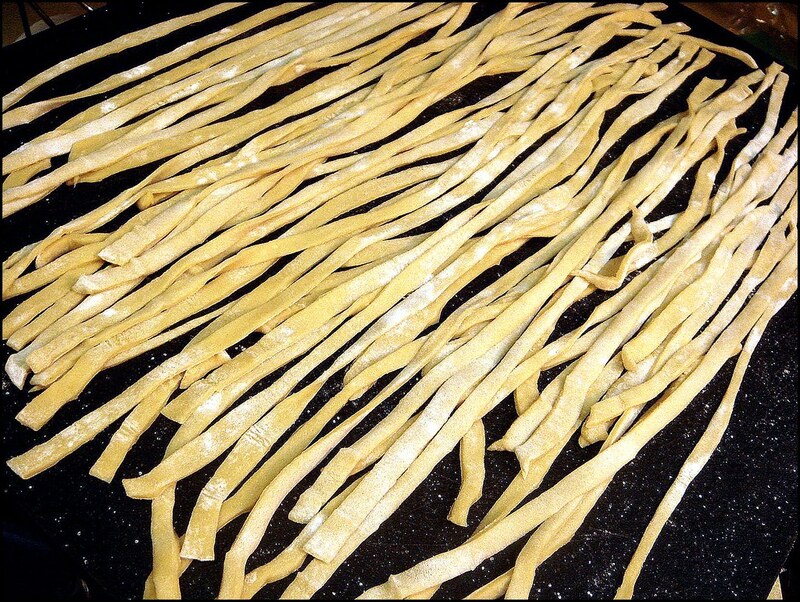 Fresh noodles cook much more quickly than when dried, so when you add them to soup, do so at the very end. If you're making a sauce (I'd recommend a fresh tomato sauce or a marinara to showcase the noodles instead of smothering them), make sure it's completely ready before you cook the noodles. Beat eggs until light. Add salt and water. 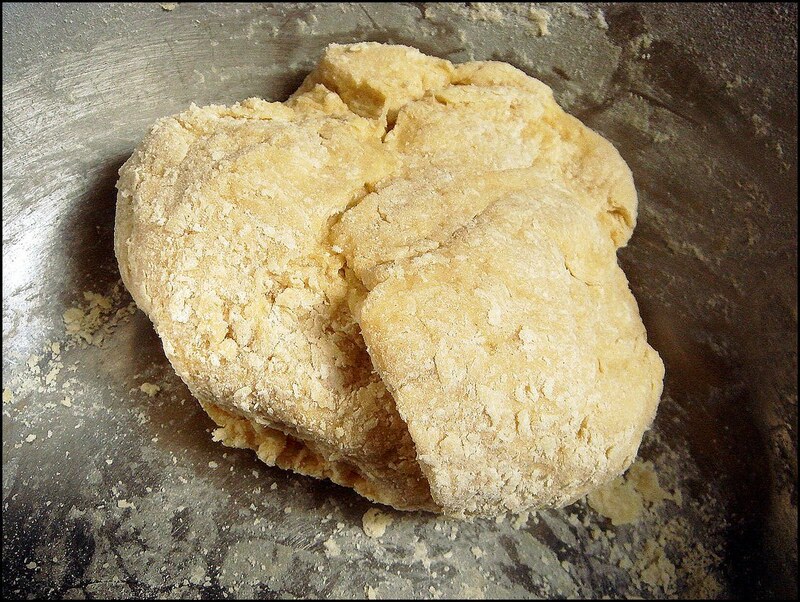 Work in flour to make a very stiff dough. 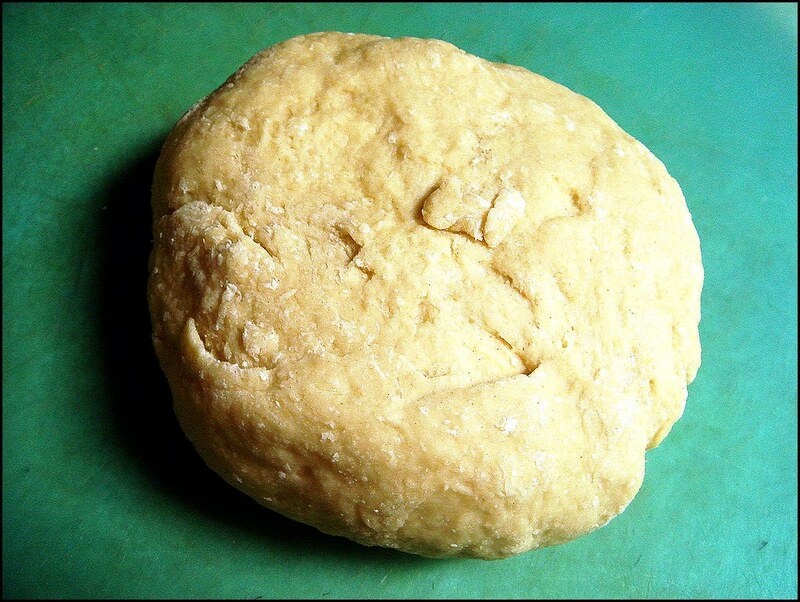 Knead, then form into a ball, cover, and let rest 15 to 30 minutes. 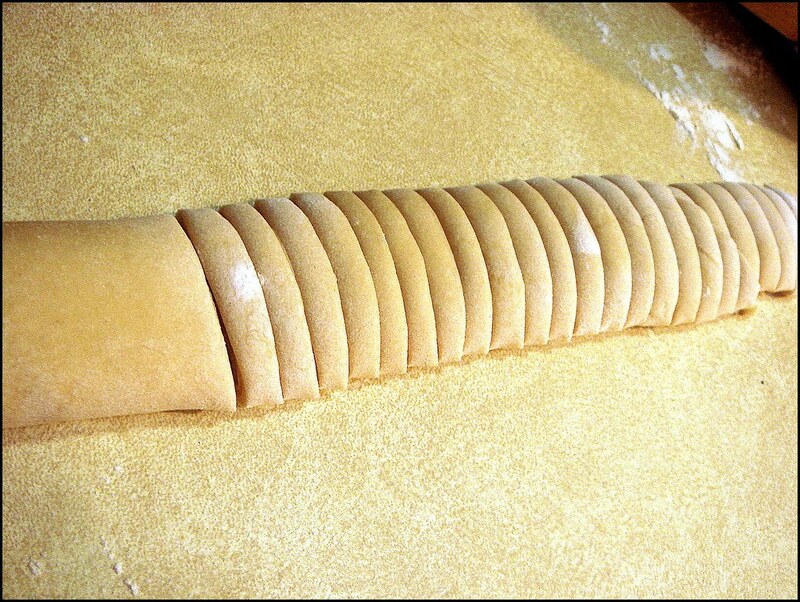 Roll out on a floured board until very thin (you may need to let the dough rest for 5-10 minutes, covered, then come back and roll it out again). Dust top with additional flour and roll up like a jelly roll. Cut into desired widths. Spread out on a flat surface and let dry for two hours. When ready to cook, drop in boiling water or broth and cook until tender (noodles should be chewy, and the insides won't look raw or mushy, probably about 2-5 minutes -- the recipe didn't give specific times). I've been sitting on this recipe for a while out of laziness and then other posts that needed to come first. Now, I can talk about one of the most amazing things I've made this year: aioli. Aioli is basically a garlic-flavored mayonnaise sauce made with olive oil, and absolutely worth making at least once. Unlike some recipes, the recipe I used (from Stevia in the Raw) uses the entire egg and not the yolk. You also make this using a hand held blender instead of wrist strenth, a blender, or a food processor. Once the egg, garlic paste, lemon juice, and a bit of olive oil is mixed together, you slowly drizzle in the remaining oil until fully emulsified and thick. Stir in the half packet of stevia, honey, and some coarse salt (I forgot to add black pepper) and you're good to go (and by go I mean eating aioli straight from a spoon -- wait, what?). A long time ago I thought of making mayonnaise. I'm not sure if it was for a recipe, or if it was simply because I wanted to try it once, I really can't recall. I do remember that it was a flop. Unfortunately, I can't remember how it messed up, but it had to do with not quite emulsifying correctly even after blending it longer than necessary. Needless to say, the batch got thrown out and I never went back to trying it again. I wasn't defeated, I just don't often eat mayonnaise anyway. So you can imagine how thrilled I was at how easily this recipe came together, and how completely delicious it turned out. Spread on a sandwich, on meat, on fish, (from a spoon), on eggs, on toast, on crackers, on steamed vegetables, or... from a spoon. 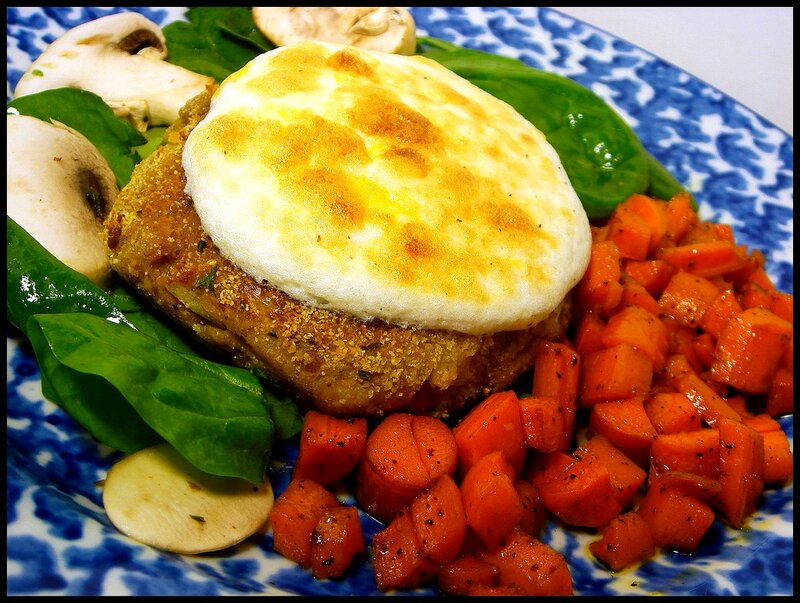 I served this with breaded and pan fried chicken strips and a simple barley-spinach salad. And I think I doubled the garlic because that's how I roll. Using hand held mixer, process at high speed until garlic is fully incorporated. With mixer still on, slowly add remaining olive oil in a stream and blend until mixture is fluffy and creamy. (If the mixture gets too thick, you can add a little cold water and continue blending) Stir in honey, Stevia Extract In The Raw and sea salt to taste. Makes (1 1/4 cups) 8 servings. A quick glance at the ingredient list shows minimal ingredients, but also includes erythritol, which apparently is a naturally occurring sweetener that's sweeter than granulated sugar and has almost no calories. Classified as a sugar alcohol, erythritol is found in small amounts in various fruits, vegetables, and fermented foods. I don't know much more about it, so if you're curious I'd suggest looking it up. 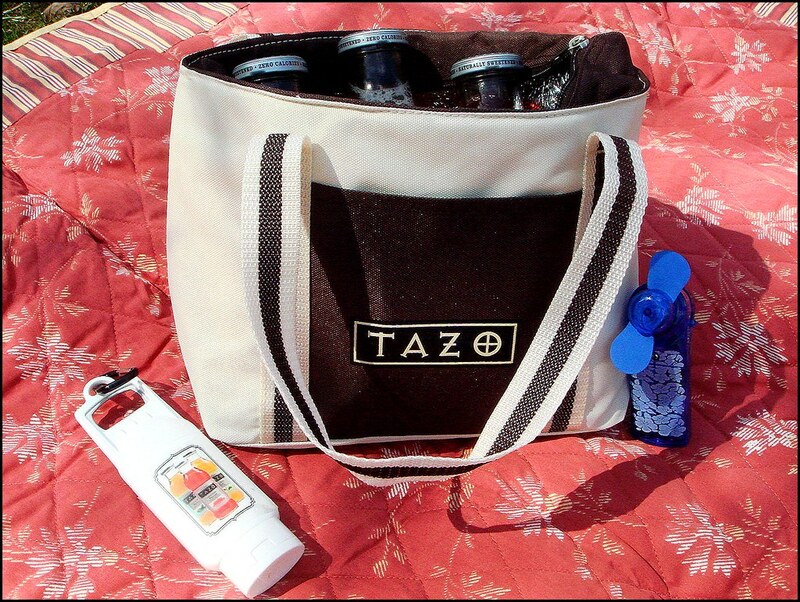 Back to Tazo, they are hosting a Tazo Zero Calorie Sweepstakes. 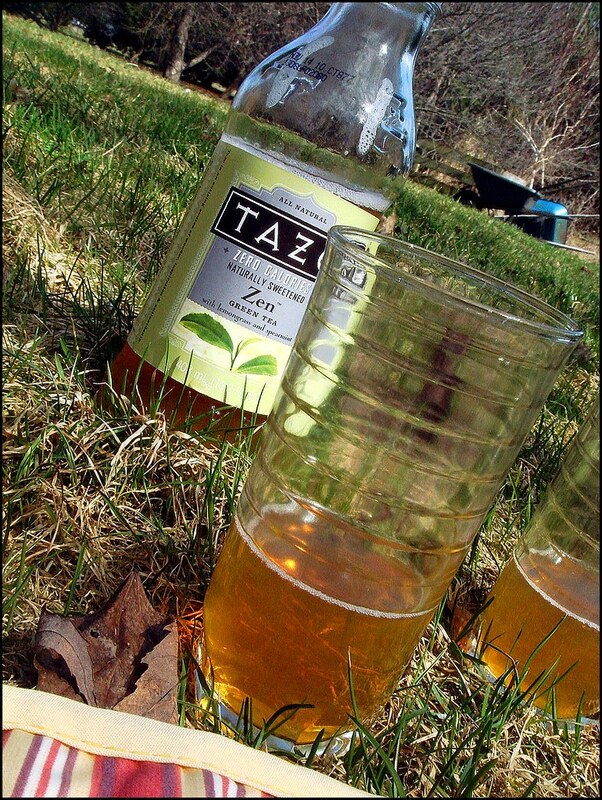 By telling them your definition of relaxation, you are entered to win all three flavors of their new tea, and possibly a $100 SpaFinder gift certificate. 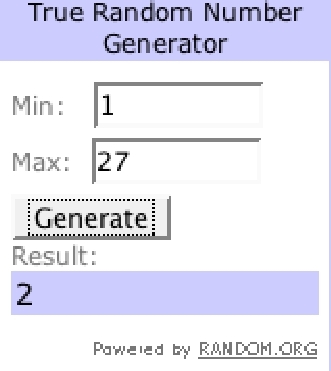 You can enter daily. I haven't had a chance to taste the teas yet, so I'm not "endorsing" the product in any way -- I generally reserve reviews for products I've had the opportunity to taste first. Also, I'm not necessarily advocating a sugar-free lifestyle, but as an occasional alternative, I'm interested in products using stevia over typical artificial sweeteners. This recipe, filed under "lunch", is a quick, creamy vegetable soup that can be whipped up very quickly. The trio of vegetables in this soup is accented by white wine vinegar and white pepper, both adding a subtle taste that brightens the flavors along with the addition of lemon rind to finish. Also, there is no cream here. The "creamy" texture is achieved by oatmeal being cooked with the simmering soup mixture before being pureed. I used a blender, but an immersion blender would speed the process up more. I did find that a dollop of sour cream stirred into each individual portion also added a nice smoothness to the soup, so adding about 1/4 cup to the entire soup would also work. A comforting soup that's packed full of healthy vegetables. 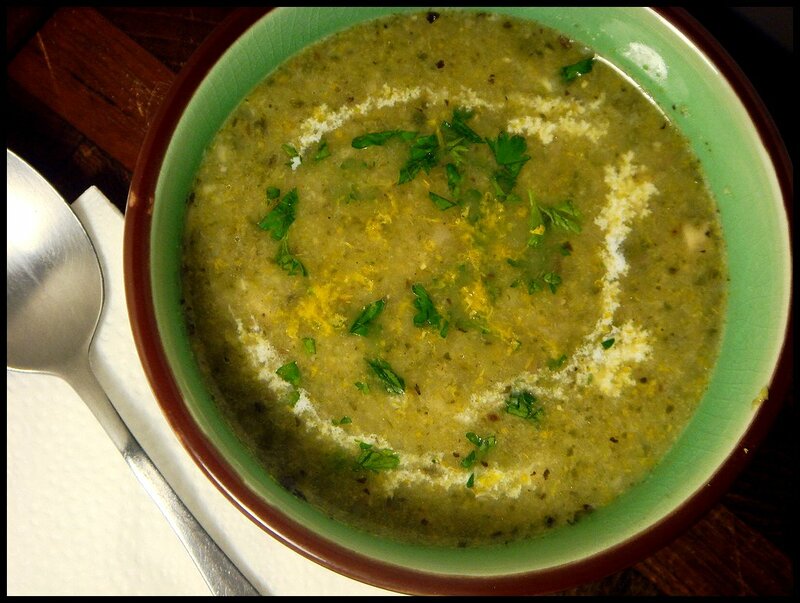 While the soup contains no actual cream, the addition of oatmeal helps to bind the soup together after it’s pureed. Bring chicken broth and water to a boil in a medium-sized pot on high heat. Once boiling, add broccoli and boil for 1 minute. Reduce heat to medium and maintain a rapid simmer. In a skillet, heat 1 tablespoon olive oil on medium heat. Once hot, add onion and saute for 1 minute. Stir in basil, white pepper, and salt. Add mushrooms, spinach, and remaining 1/2 tablespoon olive oil; saute for 2 minutes or until spinach has reduced and mushrooms have cooked down a little. Deglaze the skillet with white wine vinegar and cook for 30 seconds. Transfer content to the pot with broccoli and stir in oatmeal. Simmer on medium for 15 minutes. Carefully ladle a third of the soup into a blender or food processor. Cover and puree until smooth, pouring the soup into a bowl. Repeat with remaining soup. (You can use an immersion blender instead, pureeing soup right in the pot until completely smooth.) Pour back into pot, taste for seasonings, and simmer until heated thoroughly. Serve with parsley, sour cream, and lemon zest. This, I believe, was the second-to-last recipe I created for Family Bites. I wanted to create a healthier chicken and fries combination, and I think this hit the mark. The chicken is marinated in an egg white-corn starch mix with some seasonings to tenderize the meat and keep it moist, then the strips are rolled in rice krispies and baked until crisp and cooked through. The coating remains crunchy while the chicken inside isn't dry at all. My favorite way to make crispy baked potato wedges that mimic regular fries is to boil the potatoes briefly before baking. This sort of partially cooks the potatoes and takes away from the baking time. Make sure you pat them dry or else they'll end up steaming instead of roasting. The next step is to toss them with only enough oil to coat the outsides. This kind of just helps the browning without the excess oil soaking in. To finish, you saute butter with garlic and chili powder and pour it over the finished potatoes. Using Newman's Own Oil & Vinegar dressing, my mom suggested making a quick sticky sauce to dip the chicken strips and potatoes in. She got this idea from a sticky chicken recipe she makes, but instead of using it as a marinade-sauce, we just boiled the dressing, soy sauce, and sugar together until slightly thickened. Ours came out rather salty, but I think that's because of the soy sauce I used. It really added flavor to the chicken, though. This was probably the longest recipe I created, but obviously it's more of an entire meal than just the entree. Looking at the other Family Bites recipes, it probably wasn't necessary to do this, though I had the idea and decided to go with it. Serve this with a salad for greenery. 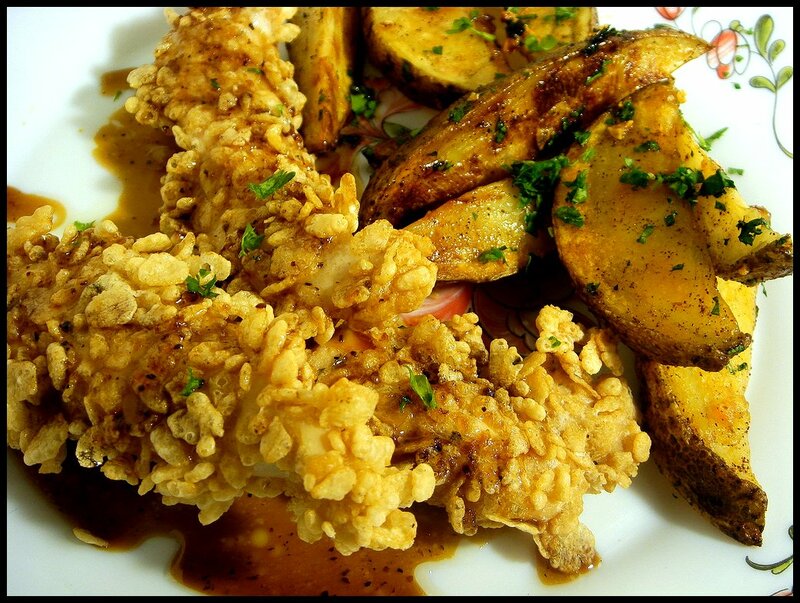 Baked chicken fingers with a crispy rice cereal coating and roasted potato wedges. Served with sticky dipping sauce featuring Newman's Own Oil & Vinegar dressing. Preheat oven to 400°. In a medium bowl whisk egg whites until frothy. In separate, small bowl whisk cornstarch with salt, basil, and cayenne pepper. 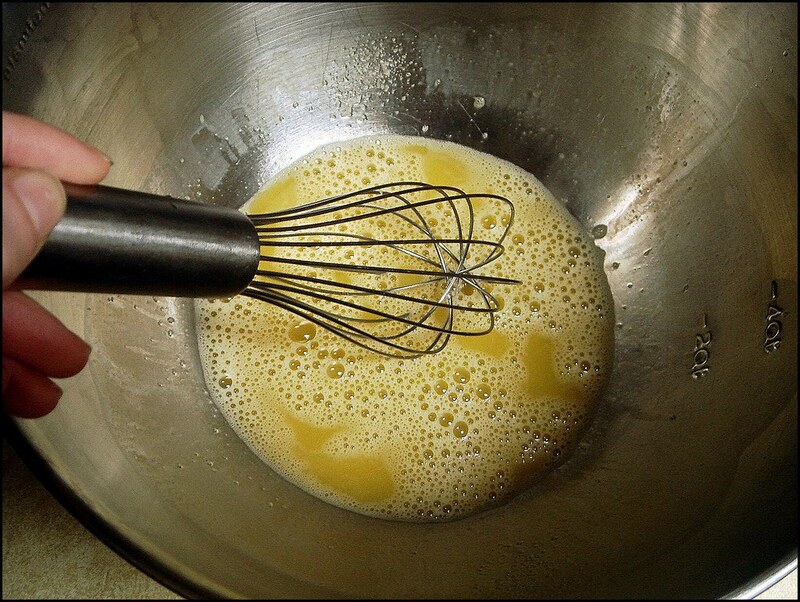 Whisk into egg whites until completely smooth and slightly thickened. Stir in chicken strips, making sure the egg white mixture coats chicken evenly, and marinate for 25 minutes. While the chicken is marinating, whisk Newman's Own Oil & Vinegar dressing with soy sauce and sugar in a small saucepan. Bring to a boil on medium-high heat, then reduce heat to maintain a steady boil for 6-7 minutes. Lower heat; cover and keep warm. Spray a rimmed baking sheet with cooking spray. Spread rice crisp cereal out in a pie dish and roll chicken strips in cereal, coating evenly. Place on baking sheet. Move sheet with potatoes onto lower oven rack and put sheet with chicken fingers on middle rack. Bake for 10 minutes. Flip chicken fingers over. Continue cooking for another 5 minutes or until the chicken fingers are a light golden brown. During last 5 minutes, melt butter in a skillet. Saute garlic with chili powder for 2 minutes, being careful not to let it brown. Drizzle over potatoes on baking sheet with potato wedges and toss to coat. Sprinkle with parsley. Divide chicken fingers and potato wedges. Serve with sticky soy dipping sauce. Preheat oven to 425°. Bring a medium-sized pot of water to a boil with 1 teaspoon salt. Slice potatoes in half lengthwise, then each half into quarters or thirds depending on the size. Add half the potato wedges to the boiling water and boil for 1 minute 30 seconds. Remove potatoes with a slotted spoon to a colander; pat dry with a paper towel and place on rimmed baking sheet. Repeat with remaining potatoes. Pour 1 1/2 tablespoons vegetable oil over potatoes and sprinkle with 3/4 teaspoon salt; toss to coat evenly. Roast for 30 minutes, turning potatoes over halfway through. Decrease oven temperature to 400°. Move sheet with potatoes onto lower oven rack. Bake for an additional 10 minutes, then flip potatoes over. Continue cooking for another 5 minutes. During last 5 minutes, melt butter in a skillet. Saute garlic with chili powder for 2 minutes, being careful not to let it brown. Drizzle over potatoes on baking sheet with potato wedges and toss to coat. Sprinkle with parsley. This was another Family Bites recipe, and for this I wanted to create a black bean burger that was substantial, yet not dense, and the end result was really delicious and one of the best non-meat burgers I've made. To increase the nutritional value, the burgers include both whole oats and oat flour, which also helps bind the bean mixture together and helps with the texture. The burgers have a Mexican flavor, so if you ate this as a sandwich you could serve it with guacamole and sour cream. I want to experiment with freezing these. I'm guessing I'd have to cook them first, then freeze. To reheat I'd probably heat up some olive oil in a skillet, lightly sear both sides then add some water to the skillet, cover with a lid, and let steam until thoroughly heated, finishing by removing the lid and cooking until the water evaporates. I guess. But these would be great to have on hand. As an accompaniment, I made a cole slaw with lime juice and honey mustard dressing with cole slaw, shredded carrots, and onions. Since I used Newman's Own dressing for the recipe, feel free to replace it with whatever you can find. This is all I have to say because I have a migraine, and you'll find the recipe after the jump. Wait. This was a latter-stage recipe, and I'm a bit disappointed because I felt like I lost my creativeness and copped out by making the cole slaw. They were looking for salads, but more along the lines of a meal salad than a side dish, and this wasn't very creative at all. What I realized throughout the entire process was that creating recipes was more difficult than I had originally thought, but for the most part in the time I had I think I did a good job, even if some of the recipes seem lackluster. 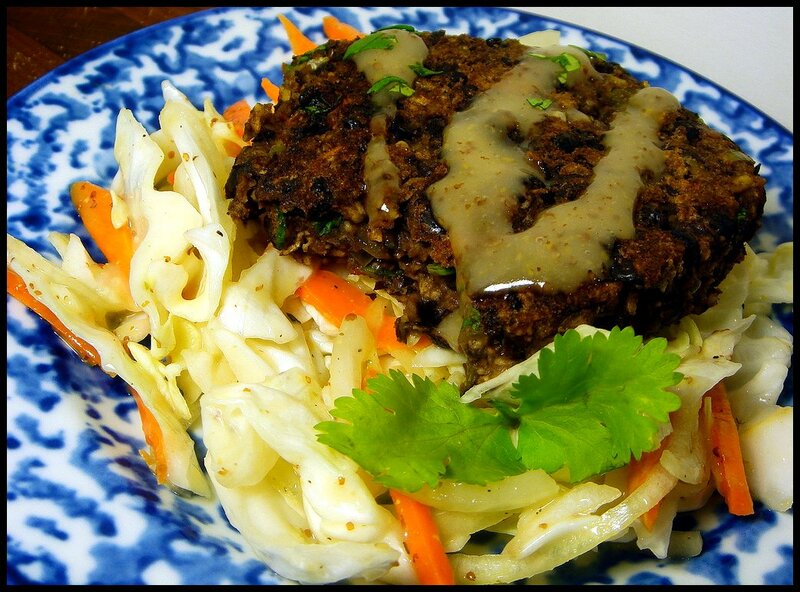 A flavorful, hearty black bean burger paired with a crunchy honey mustard coleslaw is the perfect light, make ahead lunch that’ll take you through the day. Heat 2 tablespoons vegetable oil in a skillet over medium heat. Once hot, add bell pepper and garlic and saute for 2 minutes. Add in oregano, cayenne pepper, and salt and saute for 1 minute. Stir in tomatoes and let cook for 10 minutes on medium heat, stirring occasionally. Pour in 1 tablespoon lime juice and cook for 30 seconds, then stir in 1/2 cup whole rolled oats and cook, stirring, for a minute. Remove from heat. In the bowl of a food processor, add 1 1/2 cups black beans and vegetable-oat mixture; pulse 5 times or until the black beans are broken up and no whole pieces remain. Scrape down the sides of bowl; add remaining 1 cup black beans and cilantro and pulse for about 7 times until mixture is blended (some black beans may remain whole). Dump mixture out into a medium bowl and stir in ground oats. Refrigerate for 25-30 minutes. Meanwhile, mix together green cabbage, onion, carrot, remaining lime juice and zest. Stir together. 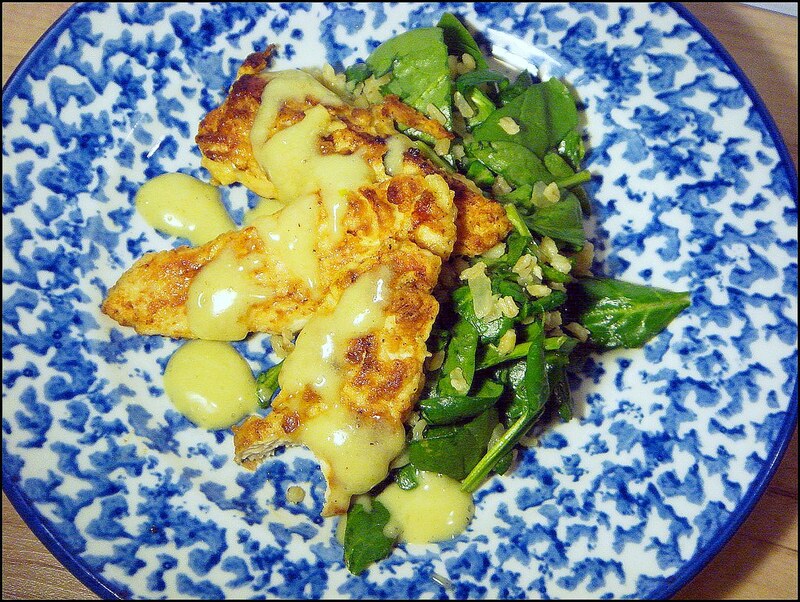 Pour the Newman's Own Light Honey Mustard Dressing on top and sprinkle with black pepper. Stir to coat and refrigerate until ready to serve. In a large skillet, heat 1 tablespoon of oil on medium heat. Measure out 1/2 cup of black bean mixture per burger and pat out to a rough 3 1/2-inch diameter. Place in skillet. Repeat with burger mixture until 4 burgers are in skillet. Cook for 3 minutes; flip over and cook for another 3 minutes. Remove burgers to a plate and continue cooking remaining black bean mixture. To serve, divide coleslaw between plates and place a black bean burger on top. 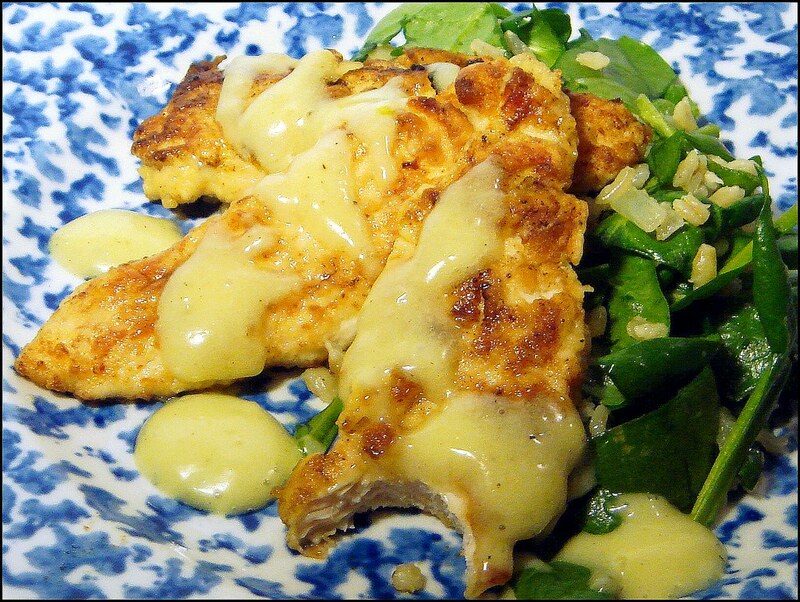 Serve with additional Newman's Own Light Honey Mustard Dressing and chopped cilantro. 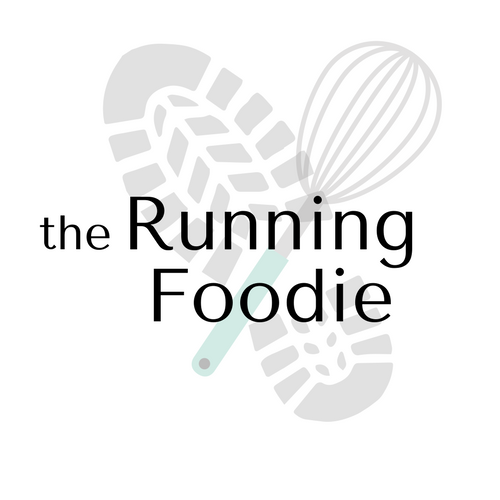 I'll finish up with the Family Bites recipes this week, but now I'm going to talk a bit about my running (GASP!). Besides the sudden warm up in temperature, I've been pretty happy with my running because I've actually been running, and I'm getting excited for all the races. This is really important because usually I don't run through winter and, come January, I'm not used to the cold, wind, etc., and I didn't give myself enough time to race strongly. I feel now that I'm running consistently enough to have a pretty good race season! My goal for December was just to run. Every single day. This may seem excessive, but I knew that by keeping the intensity low overall and not running more than my body could handle, I'd be able to do it. And I almost did but for Christmas, the Sunday after, and New Year's Eve. Nonetheless, I was happy in setting a goal I actually (sort of) accomplished, running-related, and I noticed an improvement in recovery turnover and speed. It was cold and windy. And I admit that no one should listen to me speak when I run in the cold and wind. Over at the Runner's World forums they were holding a mileage challenge. I figured this was a good idea because it would give me something else to focus on. The first week of January was devoted to finishing up the Family Bites recipes, and I didn't run but thrice and only 2-5 miles. The next two weeks were the first time I ran over 40 miles a week, though I struggled a bit in the second week because I pretty much felt worn out. This wasn't planned at all, I just decided to run more. The last week I didn't run at all because it was single digits outside -- I know my limits. Midway through January I began looking for a race sometime in the spring as a reward of sorts for being consistent. And so... I'm running my first half marathon, the Notre Dame Holy Half! I didn't actually sign up until February, when registration opened. But I'm currently in between a state of nervousness and excitement. Here, the shortest month of the year, I attempted to streak again, and was successful! I decided to use the streak as a pseudo-training, alternating longer days with much shorter days. I'd consider it a success since I ran a total of 139 miles, the longest ever, and I got some solid long runs in. I also saw an improvement in speed, and I realized that I don't need as many rest days as I thought unless it's obvious I need a break. Another thing I realized is that I need to start fueling (or at least hydrating) during the run. (As fun as eating peanut butter volt cookies during a run was, chewing while running is rather difficult.) I also need to cut back on coffee and drink more water. Seriously. I just bought a hand held water bottle and I'm looking forward to testing it out on my next run. I've also learned that running with a baseball hat is AWESOME. It just shields my face from the sun better and I don't squint as much. But I do squint. I find myself, during the latter stage of a run, that I do some squinty thing where I close one eye, I look down, and just stare at my shadow. I don't know if I'm trying to fall asleep, or if this is my attempt at "getting in the zone", I don't know. I do know that I when I suddenly look up because I see a pole sticking out of the ground I freak myself out. And so we find ourselves in March (already! ), where the temperature has warmed up, a most pleasant reprieve, and the sun has come out with some semblance of regularity. After having run through months of dreariness, I can't begin to tell you how much seeing the sun has made me happier. Also, I need to wear sunscreen, I sort of have a tan (but not, because I'm really pale so when I first get a tan it's more of a joke) thanks to running in shorts. My focus in March is to get in a few more long runs (yesterday was a 12 miler), so I'm planning on a ten miler either this week or next. I'll also be incorporating some more speed workouts, which I think I can handle now, and gauging my progress by running a mile test each month through September. All I need is for my legs to feel normal again. It feels like it's been longer than a week since February, though my legs are saying something different. For the half, I'm hoping on subbing 2 hours. I feel like this should be possible because although I've been averaging in the 9's, pace-wise, I haven't felt like I've been running hard. I'm not following a formal training plan, I'm just running a lot and making sure my overall mileage supports the distance. Race day adrenaline seems to come into effect and hopefully that proves true for this race, too. I'm also gathering tips and advice from other runners who've run a half and stuff, so let me hear it! A change to my blog: I've added my Daily Mile widget to the sidebar on the right. This way, since I seem to not talk about running much, you can see that I have indeed been running as well as keeping up the foodie part of my blog. Feel free to friend me if you're also on Daily Mile! Let me know how your running is going, or activity in general if you're not a runner. Any races coming up? I can't remember when I made this one, but it was near the end and my brain was absolutely fried. My mom already helped me out with one recipe (which I'll post later) and she also helped me add up the times for everything, which was almost worse than making up the recipes! So we kind of were all sitting around and someone decided to "brain storm" by throwing out a bunch of stupid ideas. Along the way my dad said something about a dip in bread bowls, though the exact wording sounded dumber (yes, it did, and I wish I could remember it because I first gave him sort of a Spock stare minus the Dramatic Spock Eyebrow Raise before laughing), though for a split second it all made sense and I realized that having your own dip in an edible bowl would make the perfect party appetizer. If you whip up a pot of chili, after eating the dip with crackers you can fill the bread bowls up with chili and you've got a meal! My concern for this was that I didn't have mini bread bowls, and I most definitely did not feel like waiting around to bake bread for 2 hours. After a quick Google search I found a recipe for hamburger buns from All Recipes. The dough comes together and kneads very quickly, and the only rise is after you form the balls of dough, so really quick and perfect for my time crunch. With that out of the way, I proceeded to make the dip. Bacon, for sure. What else? Caramelized onion. It gives it a bit of sophistication while lending a really delicious flavor to the bacon. A combination of spices, Worcestershire sauce, and liquid smoke makes the flavor a unique and very hard to resist. For the creaminess, I used fat free cream cheese and plain yogurt. The yogurt sort of thins the mixture out while maintaining the tangy flavor. A sprinkle of sliced scallions at the end and your party, or movie night, or game night, is all set! 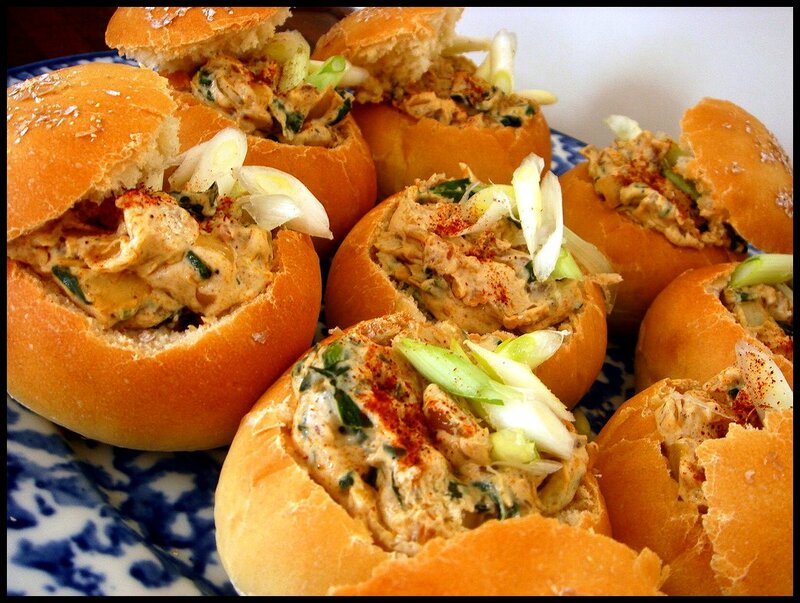 A festive, flavorful onion dip served in individual bread bowls. In a large skillet, cook bacon on medium heat until browned and crispy. Remove to a paper towel-lined plate and crumble; set aside. Remove all but 3 tablespoons bacon grease from skillet. Add diced onion, salt, and black pepper and cook for 10 minutes or until reduced and caramelized (the onions will look brown because of the bacon bits, but they shouldn't look charred or browned around the edges; adjust heat accordingly). To onions, stir in chili powder, celery salt, and paprika; stir to coat onions and until the seasonings coat the bottom of skillet. Toss in spinach and stir until completely wilted. Add Worcestershire sauce with the liquid smoke, stirring up the fond from the bottom of the skillet. Reduce heat to low and stir in cream cheese until completely smooth and blended with onion mixture. Stir in yogurt and crumbled bacon. Either hot or at room temperature, spoon about 2 tablespoons onion dip into hollowed out dinner rolls. Garnish with scallions and a sprinkle of paprika and top with lids. Serve immediately with crackers; alternatively, you can refrigerate until serving time. 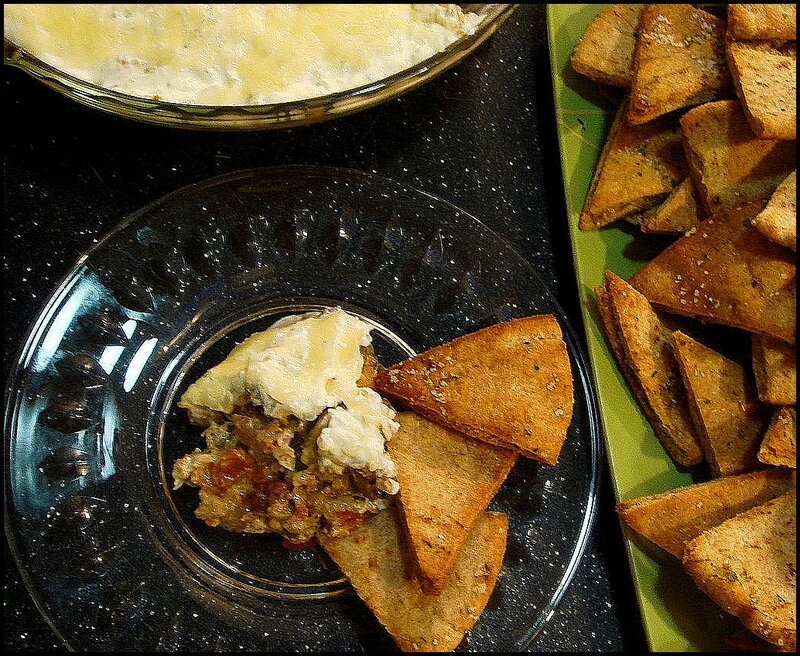 I wanted to include some really good snack recipes with my submissions, and one of my favorites out of the bunch is this Greek Eggplant Dip, a take on moussaka (a lamb-eggplant casserole of sorts with a bechamel sauce) and tzatziki (a fresh yogurt-cucumber dressing). I wasn't going to use lamb, so I switched that out with turkey because I like it and it has a milder flavor than beef. My first take was roasting the eggplant separately, then tossing it with the finished turkey-tomato mixture. The result was tasty, but some tasters didn't quite like how the flavors stood out more (some allspice, cinnamon, nutmeg) and we all felt the texture of the eggplant didn't blend well. Moussaka is cooked for at least 45 minutes, and that's plenty of time for the eggplant to achieve sort of a creamy, melty texture. Here, the eggplant wasn't roasted long enough for it to fall apart. My next try was to add the eggplant to the simmering turkey mixture. This proved to be the winning method, as the flavors melded much better and the end result was completely delicious. To make the "cheese" part, I decided to strain yogurt so it wouldn't be very runny, then mix it with peeled, seeded, and grated cucumber (which has quite a bit of liquid, hence the strained yogurt). I then added fresh garlic along with oregano and salt, then set that aside while I prepared the filling. You can serve this with whatever you'd like, though pita chips are definitely preferable. The great part about this recipe is that although it's a bit time consuming, you can make it the day before you need it, even two days, and the flavor will only get better with time. Thinking back on this, I have some eggplant I need to use up and I'm now hungry. Mom on the Run is having a wonderful giveaway over at her blog for Le Creuset Pinch Bowls, a set of brightly colored bowls that hold just a little of an ingredient. I can't think of how many times when prepping ingredients I'm looking around for a bowl that's small enough for the amount needed, it gets aggravating sometimes! Check it out. Moussaka, the classic Greek eggplant-lamb dish, has been turned into a savory dip for snacking. The lamb has been replaced by ground turkey, and instead of the cheese topping there are layers of tzatziki, a fresh cucumber-yogurt sauce. For yogurt: Grate the cucumber (if the yogurt has not been strained for at least 2 hours, press the liquid out of the grated cucumber with paper towels) and mix with yogurt, oregano, garlic, and salt in a bowl. Place in fridge. For eggplant and turkey: Meanwhile, on medium heat brown turkey in a large skillet until almost completely browned. Add 2 tablespoons olive oil to turkey along with the onion and garlic; saute for 1 minute. Mix in the oregano, cinnamon, allspice, nutmeg, red pepper flakes, and salt. Once mixed, stir in the eggplant with remaining tablespoon olive oil and toss to coat. cook for 5-7 minutes, until eggplant begins to cook down. Pour in the tomatoes, stir, and cook for 15 minutes, covered. remove lid and cook for 5 minutes so any liquid evaporates. Remove from heat and let cool for 15 minutes. In a 9-inch glass pie dish, spoon half of the eggplant-turkey mixture onto bottom and spread to edge of dish. Dot half of the yogurt layer on top of the turkey and carefully spread to edges. Repeat with remaining eggplant-turkey mixture, and finally the yogurt, carefully spreading to the edges. (Dotting the mixture around the entire surface helps make spreading easier.) Chill in refrigerator for at least an hour before serving. Serve with pita chips, soft pita wedges, baguette slices, crackers, or chips. This is the second of three recipes I thought of immediately. Everybody enjoys a good BLT sandwich, but since we were asked to focus partly on salads I decided to work the elements of the sandwich into a salad. Following the classic Italian panzanella (bread salad), my main focus was how to best make the croutons. I used day old homemade bread because that's how it worked out, but fresh bread (not straight from the oven fresh) would work because you toast the cubes in the oven. To incorporate the Newman's Own product, I tossed the baslamic vinaigrette with garlic and tomatoes with the cubes and roasted until crispy on the outside. This way, you get the taste of the vinaigrette on the salad itself and also infused into the bread. And yes, there is plenty of bacon. The classic sandwich meets an Italian salad in this adaptation of two favorites featuring homemade croutons and bacon. Preheat oven to 400° degrees. On a rimmed baking sheet, toss bread cubes with garlic, half of the grape tomatoes, and 3 tablespoons Newman's Own Balsamic Vinaigrette. Sprinkle lightly with black pepper. Bake for 20 minutes, tossing halfway through. Remove sheet from oven and place on a cooling rack. Meanwhile, heat a skillet on medium. Stack slices of bacon and slice into six pieces. Place half of the bacon in the skillet and cook, stirring occasionally, until crispy, about 7 minutes. Using a slotted spoon, remove bacon pieces to a plate lined with paper towels. Drain bacon grease and repeat with remaining bacon. In a large bowl, mix together romaine lettuce, spinach, and mushrooms. Sprinkle with remaining 3 tablespoons of balsamic vinaigrette and toss to coat. Add the bread cubes to the lettuce and spinach and toss again. 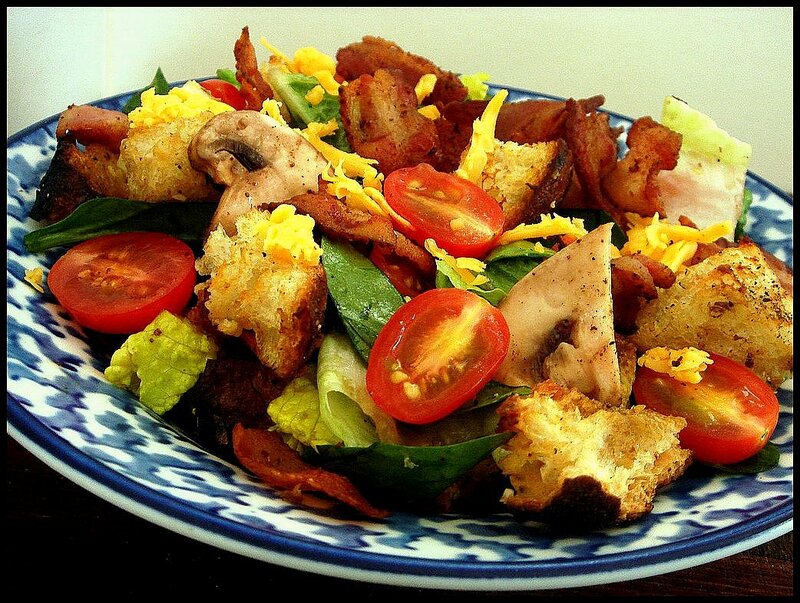 Divide salad among bowls and top with bacon pieces and cheddar cheese. Drizzle with additional Newman’s Own Balsamic Vinaigrette before serving. Near the end of December Foodbuzz offered some of their featured publishers the opportunity to create recipes around Newman's Own products. I was able to participate, though I wondered what I had gotten myself into since I've never really created recipes other than throwing ingredients together for a quick meal. We also were under a bit of a time crunch, but thanks to my family pulling through at the last minute they gave me some ideas to work with when my brain was fried. The very first recipe I created was the Mexican Tortilla Quiche. Most quiches either have the traditional pastry crust or are just the eggy filling, though I chose to use corn tortillas with cheese as the base, keeping with the Mexican cuisine theme. The filling consists of a ground turkey flavored with herbs and vegetable. This definitely was a hit, and we all liked the crunchy corn tortillas that were at the edge. Throughout the week I'll highlight some of the more interesting recipes (interesting in terms of the process leading up to the creation). A savory, Mexican-flavor quiche with a quick and unique corn tortilla crust. Heat a skillet on medium heat with 2 tablespoons oil. when heated, add corn tortilla wedges and stir for 2 minutes or until softened. spray a 9-inch pie pan with cooking spray. 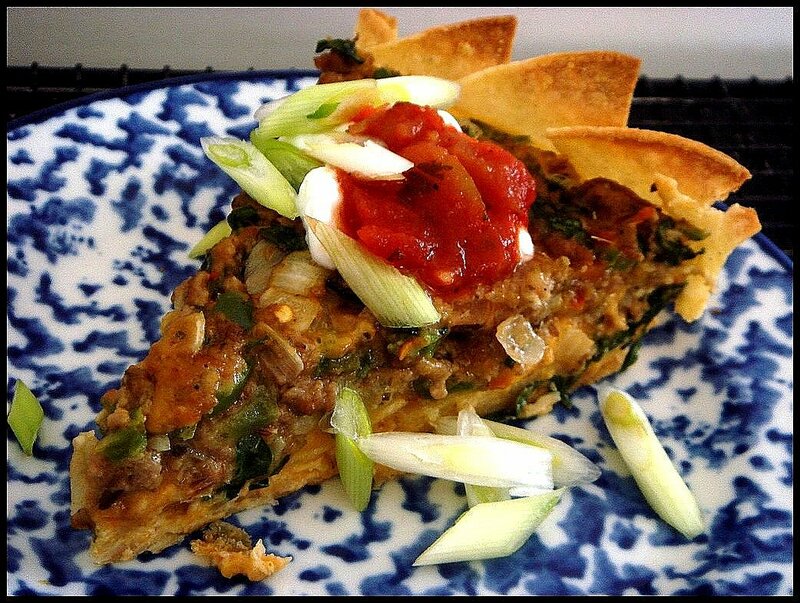 place corn tortilla wedges in pie pan and spread around bottom and up the sides to form a crust. using 3/4 cup cheese, sprinkle over bottom and edges of corn tortillas and press slightly. Cook ground turkey in a large skillet over medium heat until just brown, breaking any large pieces (drain excess liquid if necessary). Add oil, onion, bell pepper, and garlic to the skillet along with cumin seeds, red pepper flakes, oregano, salt, and pepper; saute for 5 minutes or until onions are translucent and bell peppers have softened. Remove from heat; stir in spinach. Preheat oven to 375° degrees; make sure oven rack is in the center. In a large bowl, add eggs and whisk to break yolks. Stir in milk and flour until combined. add turkey mixture along with salsa and cheese and stir to mix. Pour egg and turkey mixture into pie shell and sprinkle with 1/2 cup green onion. Place in oven and bake for 35-40 minutes, until top of quiche is golden brown. A skewer inserted in the center should come out fairly clean. Remove quiche from oven and place on a cooling rack to cool for 15 minutes prior to serving. Garnish slices with additional Newman's salsa, sour cream, and green onions.